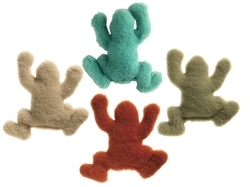 Simply Fido's adorable Mobi is made of organic material combined with natural colored knit fabric. Mobi is 6" and has 2 squeakers. 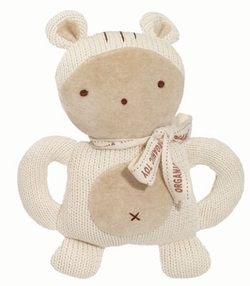 This little cutie is made with all natural non toxic fibers. Simply Fido uses an all natural pure water organic dye process. Especially good for dogs with allergies. So order one and let your dog have some fun with this organically friendly squirrel. Want An Easy Way To Start Going Green??? 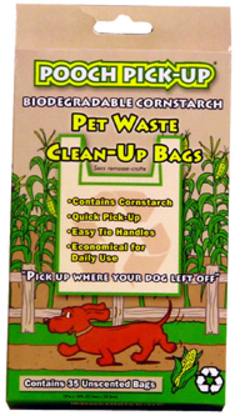 Start using these biodegradable Cornstarch Pet Waste Pick Up Bags. Unscented with easy to tie handles. It's the perfect way to get started! Over the next several months, you will notice a transition on the Moe Toys website and Blog to more Eco Friendly and Green products. So as you see these new items featured, please give them a try. We already have many Eco Friendly items on the website, one of which is the very popular Eco Friendly Dog Toys by West Paw. These cast of characters are adorable and best yet, the material and stuffing are recylcled!